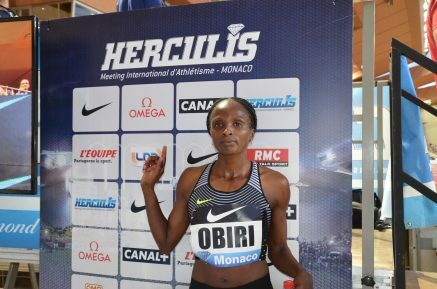 15th July 2016 – There was a stunning piece of front running from Hellen Obiri (KEN) at the latest stop of the IAAF Diamond League in Monaco. Racing in the women’s 3000m Hellen was left at the front once the pacemaker stepped aside after just one kilometre. However, she took the race on and for the next five laps proceeded to run quicker and quicker and quicker until she unleashed a decisive kick over the final 400m to move well away from second and take victory in 8:24.27, the second fastest time in the world this year. Behind Hellen, Steph Twell (GBR) continued her excellent season that has seen her collect a European Bronze medal, a national title and a 800m PB, by running another PB. She placed fifth here in 8:40.98. Mo Farah (GBR) had his annual outing over 1500m and once again was able to mix it with some of the world’s finest milers. Sitting off the early pace which went through 800 on World Record schedule, Mo was able to work his way closer to the lead over the third lap. Using the speed and strength that his served him well so many times over the longer distances he finished strongly to take fifth place in 3:31.74. Michael Rimmer (GBR) took sixth place in 1:45.38 in a difficult 800m that saw him having to run wide for much of the race.